Screens can be damaged by simplying picking up your laptop incorrectly, by high or freezing temperatures, dogs, feet, darts, footballs . . . We’ve seen a lot over the years. We charge only $40 for evaluation and installation of a replacement screen plus the cost of the screen and shipping and handling. 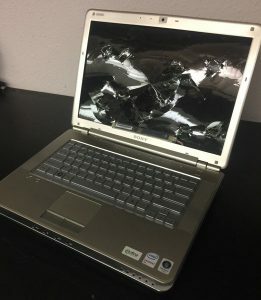 If your laptop is over 4 years old, it usually isn’t worth replacing the screen. Since the average life of a laptop is 5 years, the hard drive or motherboard is likely to go soon anyway. You can get a new laptop for about $400. If you DO need the screen fixed, first, we have to have you call us to make an appointment with our lead technician Robert to confirm that you need a screen. It could be a bad motherboard, battery, or hard drive and just appear to be the screen. When you call, we will need the exact manufacturer (Dell, Toshiba, etc.) And the model number (dv600-a01, etc). This way we can do some research on prices prior to your arrival. If you choose to order and install the replacement, and if your laptop still works, we will lend you an external monitor, so you can use your laptop. When the screen arrrives, we will set a time when we can install it while you wait. Monday to Friday: 8am to 6pm, Saturdays: 10am to 4pm.